Problem: Retail brands are defined at the point of purchase. Retail design, signage, display, product selection, return policies, customer service training, all do more to define the brand than the advertising does. The development of a new retail housewares/home furnishings store in a competitive market requires finding a niche unexplored by others. The Puget Sound area had City Kitchens, Sur La Table, Seattle Cutlery, Mrs. Cooks, and Mr. J Culinary, and had yet to experience Crate & Barrel or Williams-Sonoma. Research: Duane visited every kitchen and housewares competitor in the market area and a selection of stores belonging to the larger retailers in San Francisco and to identify their strengths and weaknesses and assess how the market was being served. Along the way noting the ideal way to display nearly every kind of product offering. Insight: The most successful home/kitchen stores focused on lifestyle storytelling with products as featured stars. Selling environments need to provide a sense of clear organization to appeal to the demographic target customer's need for order, while at the same time provide staging opportunities to tell seasonal "product stories" which would appeal to their desire to surround themselves with "nice things". The value proposition for the retail space was that the store itself would be a beautiful package for storing and displaying the products in it. Process: Duane recognized that it was important for the client to be able to express his vision of what a great kitchen/home story could be so designed a process and assembled a team to help him realize that vision. Duane sourced an architect/project manger, a construction manager, and various other product and merchandising consultants to assist the client. A stripped-down version of Duane's name generation process produced the name "Domaine". A market profile Duane created provided a rough guide for the design, merchandising, and product selection efforts. Duane's space plan created a sense of "rooms" without walls and maximized product display and over-stock storage. Duane's design themes and guidance provided help to in-store signage and lighting designers that insured consistency of brand expression. Duane's broad skill set and dedication allowed client to save money and have more say in the design process vs. specialized retail design firm yet not sacrifice quality or professionalism. Project coordinated the design thinking of architect/draftsman, cabinet makers, general contractors, display designers, signage makers, logo designers, and product buyers to create a clear and distinct retail brand. Duane's personalized approach and hands-on practices maximized the value of having internal and external contributors. The value proposition created filled a gap in the marketplace and preempted other market entrants. Store "packaging the customer walks through" resonated with staff and customers. Custom fixtures were developed for both flexibility and ideal presentation of product stories. Opened to a rave review in the Seattle Times and a steady stream of customers. Store survived the market entry of Williams-Sonoma and Crate&Barrel as well as closing of a nearby major tenant. Store required only minor remodeling for the 20 years it was in existence. Domaine, 661 120th Ave. N.E., also in Bellevue but on the east side of Interstate 405 (it's in the Larry's Market complex) has a different emphasis and quite a different environment - more like the art and craftsmanship of the kitchen. It's a very pretty store (without being in any way cute), with changing, artful displays, yet fully stocked with only top-line gear. Domaine maintains the largest display of elegant but durable stainless-lined All-Clad pots and pans I've seen in the area. The exteriors come in heavy aluminum, anodized aluminum and copper and are priced accordingly. Owned by Peter Bassiri, who also owns Seattle Cutlery in the Market, managed by Hilly Field, Domaine feels like a place you'd like to move into: i.e., pay the rent and stay. In addition to full lines of cutlery, Domaine carries sturdy maple tables and chairs, place mats and napkin rings, gadgets and art work to complete the sense of multiple dining settings and scenarios. It recently extended to bath robes. "Why not?" Field laughed. "People eat breakfast in them! We have customers who come in here with a dinner party in mind. They may ask for menu suggestions. We might start with a cookbook, get a whole series of recipes, move on to tableware and glassware, and go from there to picking out a set of napkins. We have even had some who added in flatware, a set of dishes and then took the table, too. In a way that's what we want the store to suggest. Domaine. 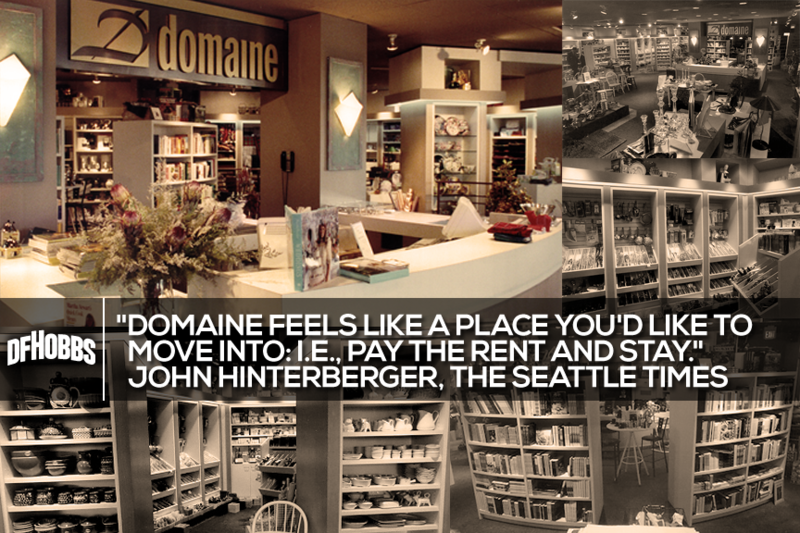 As in "your domaine." Where you live and how you live. That's why the store is always changing. Walking through here you can visualize walking through your own house." Bassiri defined it as: "I had always wanted a store with a magnitude of ideas - something elegant that no one else had done. Financial reasons were the last thing on my mind." The place is a browser's delight, but seductive. You can go in looking for a bargain and walk out with more, much more, than you bargained for. But there's a wide range of prices. You can pay $1.95 for a glass or $35 for a goblet.